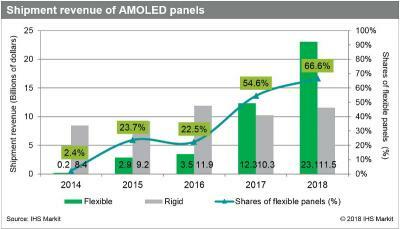 IHS Markit says that flexible AMOLED shipments more than tripled in 2017, and revenues reached $12 billion (up from $3.5 billion in 2016). Rigid OLED revenues decreased by 14%. In 2018 flexible OLED revenues will reach around $23 billion, and rigid OLEDs will also increase slightly to about $11 billion. In 2016 most flexible OLED were used in a curved form factor (edge-type phones), but in 2017 about half of flexible OLED displays were used in a flat form factor (such as in the iPhone X).